Buddhism first came to Mongolia in the 3rd century B.C., was widely promoted during the reigns of Chinggis Khan and especially Kublai Khan, and was firmly established by the 16th century. The prayer wheel is a decorated cylinder of wood or metal, inside of which is a long paper with a prayer written many times on it. The scroll can be 20 meters or yards long! The largest prayer wheels may also contain volumes of sacred texts inside. Smaller, portable prayer wheels – hand prayer wheels – are used by individuals, who typically spin the wheel in the morning and evening, but may even carry them with them throughout the day to offer prayers periodically. There are other kinds of prayer wheels too, even electric, solar powered, and digital ones! 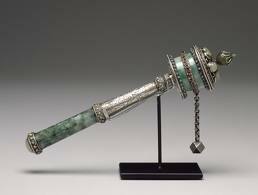 The rise in the use of the prayer wheel (reintroduction in many ways) in Mongolian culture is symbolic of Mongolian efforts to rebuild their culture and faith following the communist era. Our son also created a hand prayer wheel craft for his presentation. With the help of his six-year-old brother and the inspiration of the above picture, he used recycled art materials (love how sustainable this craft is!) and the following steps that we made up to create it. 1) Decide on a prayer to enclose. It can be the traditional Buddhist prayer shared above (“Om Mani Padme Hum”) or a brief one of your choosing. 2) Create your prayer scroll. Print the prayer (or write it out) however many times you want to. Lay it out on the page in landscape view, with the words on just one line ideally. Copy and paste it down the page, so the prayer repeats several times, leaving room to cut them apart. Then print out as many pages as you want. Cut the papers so each strip contains the prayer printed on it one time. Now tape them all together so they form a long scroll. 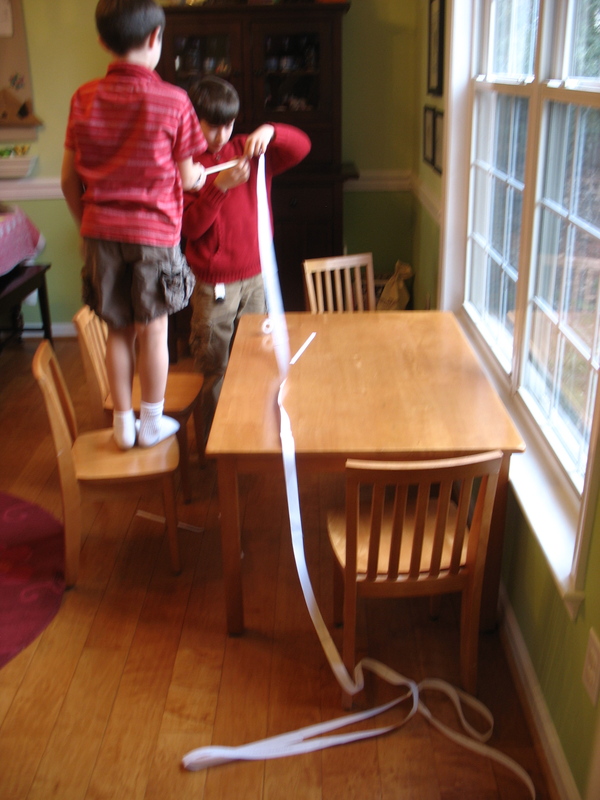 Rolling a 20 foot long scroll of prayers to insert into a Mongolian-inspired Buddhist prayer wheel. 3) Tape one end of the long scroll near, but at least 1/2″ below, the top of the dowel and then roll it around around the dowel. Leave the other end of the prayer scroll loose. We temporarily wrapped a rubber band around the rolled up scroll so it wouldn’t unravel while we prepared the next step. 4) Cut an opening at the top and bottom of the salt container to fit the dowel through. Make one of those openings a “door” to fit the dowel with scroll through. Insert the dowel into the salt container. Position it so that the top of the dowel sticks out of the top hole, with the door closed. 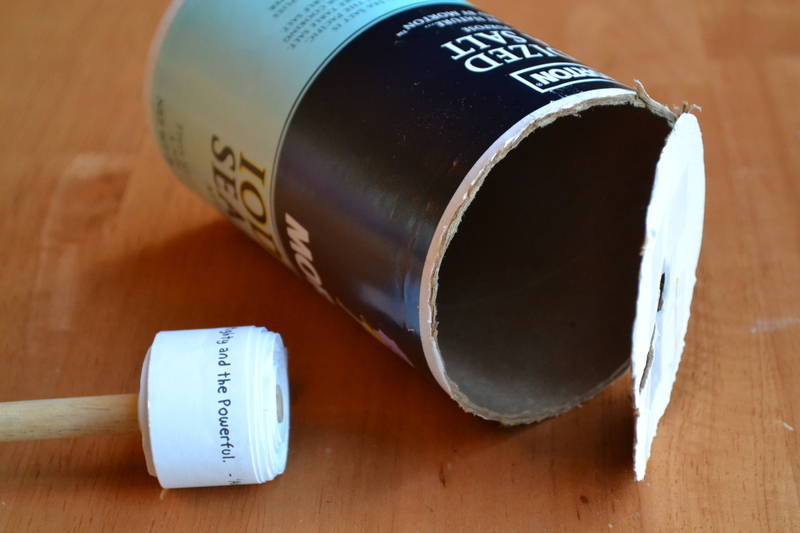 Tape up the door and wrap rubber bands around the dowel just outside the top and bottom holes of the salt container. Prayer wheel in the making. I loved seeing how the kids enjoyed learning about another culture’s and Faith’s approach to prayer and spirituality. They observed and then engaged with the common threads and unique emanations of humanity’s communication with the Divine through this exploration and craft. 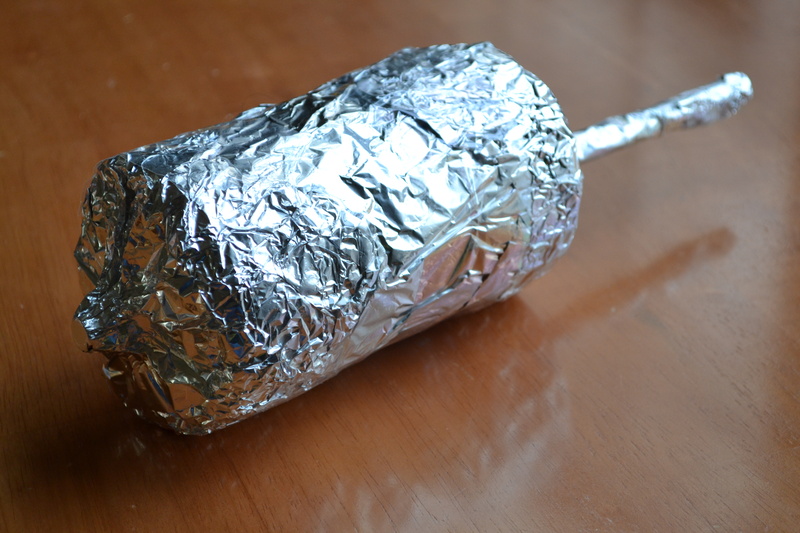 Please share pictures and tips to improve the craft if you make the Mongolian Hand Prayer Wheel! Stay tuned for our Mongolian food discoveries in Part 3. Mongolia is beautiful country with beautiful people. Thanks for commenting and sharing your beautiful photos!